Hey everyone. Long night on Friday. We our the evening at the entertaining El Domino shindig, which was loud and liquory. That's just the way we like it. I don't even mind wearing a tuxedo every now and then, which represents an abrupt shift in Tate policy. Adaptation is the key to a prosperous life, I'm told. Thanks for making the HOTTEST Auburn blog on the 'net part of your day. Final thoughts: Boring. Not much going on at all. Anything relevant will be discussed in Sunday's blog. Ugh. First quarter: Auburn was tackled for loss twice during the first quarter, which was odd. Brandon Cox hit all eight of his pass attempts. It's clear that Auburn is much, much, much better than Tennessee Tech. A long kickoff return on TTU's first possession prefaced the field goal. That's the only way TTU can get on the board. The Golden Eagles' offense is NOT good. Hey everyone. I don't have much to say up here today. It's Tennessee Tech week. What can I say? Thanks for your support of the HOTTEST Auburn blog on the 'net. I was on WNSP-AM radio (Mobile) this afternoon with long-time Auburn beat writer Neal McCready. He was asking me if the Glenn Dorsey cut-block debate had cooled at Auburn. I was like: Huh? Cooled down? It wasn't ever hot up here. Honestly, I gotta say that was one of the most lame "controversies" I've ever covered. It was an illegal block. I should have been a 15-yard penalty. Blocks like that happen all the time -- just not to Dorsey. If that happens to Mike Goggans or Antoine Carter, it never makes the paper. I'm not hating on Neal. I'm just surprised people still are discussing this. Were you surprised to read about Brad Lester's sudden groin injury this week? I was surprised to be writing about it. Tuberville said Lester has been dealing with this problem for weeks. I'm sure they'll find a way to heal him quickly next week. Doctors can do amazing things these days. I'd like to ask Brad about it, but he's one of those guys who leaves the football world when he leaves the Athletic Complex. He's hard to catch up with. Hey everyone. Thanks for all the great responses to yesterday's blog. I was concerned that it would be too technical. I know very little about the xs and os of the game, but I love learning about it from the coaches. Will Muschamp and Hugh Nall, in particular, have been great about setting aside a minute here or there to explain things to me on their dry-erase boards. I'll pass that information along when conditions merit. Everyone, including my effervescent neighbor Carolyn, wants to thank you for peeping what's offered here at the HOTTEST Auburn blog on the 'net. One guy who gets lost in the DE shuffle is Antoine Carter. He plays behind another "A.C." -- Antonio Coleman. Quentin Groves suggested that I refer to Carter as "Hot" to help distinguish between the two A.C.s. You know I'm down with anything HOT. Carter has "hot boy" tattooed on his face. It's not as scary as it sounds. Anyway, Carter has really impressed Muschamp despite limited action. I was absolutely floored by the Tigers' initial decision to play Carter this season -- he's 17 and looks it, if you know what I mean -- but he's a gifted pass-rush guy. He gives Auburn another guy who can let it rip from the outside. All the more reason to bump Groves to OLB. Tommy Tuberville said today that TB Brad Lester (groin), OL Ryan Pugh (knee) and LB Craig Stevens (foot) will not play this weekend. Word is that Stevens will be ready for the Georgia game. 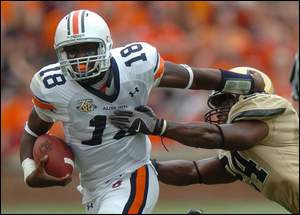 I heard that Auburn isn't expecting him back before the Iron Bowl. I mean, why move Groves if Stevens is going to return immediately? Also, it looks like TB Tristan Davis and his Achy Breaky Foot will be ready for the Iron Bowl. Hey everyone. It's been a fun day of emails. I've been sticking with a policy of not posting emails because similar enterprises involving other Advertiser writers weren't accepted well. Suffice it to say -- several HOTTIES have concerns about Quentin Groves' surprising move to strong-side linebacker. I'll discuss this more below. 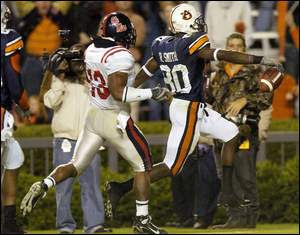 I also have a little illustration to help show what Auburn wants to do with Groves. Wise, you are, for visiting the HOTTEST Auburn blog on the 'net. a.) The emergence of Antonio Coleman and Antoine Carter at weak-side DE. b.) 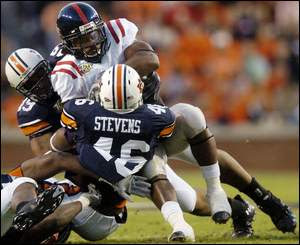 The loss of strong-side LB Craig Stevens to injury. Defensive coordinator Will Muschamp is big on changing fronts. This is a reasonably new trend in college ball. Years ago, coordinators picked a front (3-4, 4-3, 4-4 or 5-2) and stuck with it. Muschamp learned to change fronts while working under Nick Saban at LSU, then honed the concept during his time with the Miami Dolphins. The benefit of changing fronts means the defense can better "fit" what Muschamp believes the offense is trying to do. He uses two fronts: a 3-4 and a 4-3. **the nickel usually is the top-tier cornerback who isn't already at cornerback. That can be Jerraud Powers (8), Jae Wilhite (24) or Pat Lee (20). The trick here is that SLB (Groves' new position) has to be big enough to handle tackles and tight ends. It's a demanding assignment. Auburn tried to play S Eric Brock at that spot in September and it didn't work. Brock isn't big enough. Stevens has been inconsistent. Freshman Bo Harris was a thought, too, but he's had a lingering shoulder issue. Groves is the best option. Notice that Groves is back to his usual spot at weak-side end. He's still a ferocious pass rusher. Sen'Derrick Marks (94) usually slides inside. This set-up allows Auburn to maximize its sack threats. So the last question is: Why now? Well, Blackmon's injury is the main part of this. Blackmon (10) missed half the season with an ankle problem. He's been full speed for two weeks or so. He needed time to get back into the flow, and Chris Evans (59) needed some time to adjust at weak-side LB. Recall that Groves missed two games with dislocated toes. He's just now getting back to normal. Also, Muschamp now has seen enough from Antonio Coleman (52) to trust him at weak-side DE. 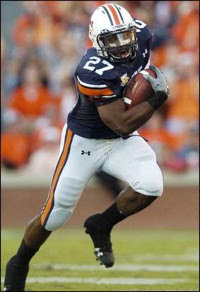 One thing I have learned from this is that Auburn doesn't have enough productive linebackers. Blackmon and Evans have been worthwhile, no doubt, but Stevens wasn't having a great season. Harris has been hurt or ineffective. Same for Merrill Johnson. I can't get a feel for Josh Bynes, who should be redshirting. Adam Herring is redshirting. 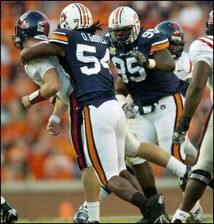 I think Auburn might benefit from signing Jerrell Harris, the hard-hitting linebacker from Gadsden City High. Just throwing that out there. Hey everyone. It's just another day at the Athletic Complex: DE Quentin Groves said he's moving to strong-side linebacker. Check below for witty and insightful analysis of this BREAKING development. Peace be with you for visiting the HOTTEST Auburn blog on the 'net. As I reported above, Groves said today that he is moving to strong-side linebacker. That's the position Groves needs to play in the NFL, so it's probably a good move for him. As I have discussed before, Antonio Coleman and Sen'Derrick Marks have been at least as productive as Groves this season. Moving No. 54 to linebacker allows Auburn to get more high-impact players on the field concurrently. This also signals some other things. The injury to LB Craig Stevens obviously is significant. Also, LB Merrill Johnson is either hurt or in the doghouse. Johnson was a starter to begin the season, but coaches don't seem enthusiastic about getting him back on the field. Tuberville said the other day that Johnson is 100% healthy. Draw your own conclusions. *On scaling back practice this week: "We're not cutting back on anything -- we're just cutting back on time. They guys are mentally and physically tired." *On LB Craig Stevens: "He will not play." *On OT Ryan Pugh: "He didn't practice." *On TB Tristan Davis: "Tristan is out running. He is not hitting anybody. He wants to play. We're taking it day by day with him." *On Tennessee Tech and its coach Watson Brown: "I like what they're doing on offesne. They have some guys who can run and they're trying to take advantage. He's a good coach. You're got to respect a guy who goes home to where he's from." *On Quentin changing positions: "He'll just be on the tight-end side. It's just a ... different scheme. He's probably better blitzing (while) standing up. This will help him on the next level -- getting him film of being a stand-up guy." *On Antonio Coleman: "He's very strong for his size. He could do a lot of what Quentin does. He has the speed. He works very hard at making himself better." *On Tuberville's claim that practice included some fistfights: ``When competition starts, tempers flare. It reminded me of two-a-days." *On Mario Fannin's role: "Mario needs to carry the ball a little more." *On the team's options to handle kickoffs: "We're looking at several guys." *On Kodi Burns role this weekend: "We're looking to go in all-out with our first-team guys. We're like to get (Burns) in as much as we can this week. It depends on how we play." Here are your top defensive producers from the Ole Miss game. Players are given points for doing significant things correctly. They are docked points for missing assignments, missing tackles, penalties or loafing. Here is the full rundown of point distribution. Here are your team defensive goals for the AU-UM game. Ole Miss' YAC (yards after contact) number was 21. That's a season low. For the few fans who are into the women's basketball team, the Tigers' situation is not looking good. Reserve guard Re-Re Hobbs has torn her left Achilles tendon and is our for the season. Starting center Keshonda Carrier is out for at least half the season due to academic suspension. Hard times for coach Nell Fortner. The men's team is not looking all that great, either. F/C Josh Dollard is out for the year because of what Auburn described as a "medical condition" while F Quan Prowell has been suspended for at least six games. Not a lot of depth remaining. Hey everyone. I got some awkward responses to my comparison between Auburn and Rutgers. It was more about Brandon Cox and Mike Teel. People think I'm being too hard on Cox. I said he was fine. He's also pretty tough. He's just not great. Cox needs his wideouts to make plays. I think that's why you're seeing more Mario Fannin these days. Thanks for rolling in for your daily slug from the trough that has become the HOTTEST Auburn blog on the 'net. Forward Josh Dollard, perhaps Auburn's best basketball player, will miss the season because of a medical condition. Also, senior forward Quan Prowell has drawn a suspension for a violation of team rules. Losing Dollard is a massive blow. I thought the Tigers were a candidate to qualify for the NCAA Tournament as a 7 or 8 seed. Not now. he will be welcomed back to play with us." Prowell's suspension will last at least six games. Coach Tommy Tuberville said something interesting about LB Merrill Johnson. He's been out with a shoulder problem since the Kansas State game. Johnson participated in two plays at Arkansas, but hasn't expanded his role since then. I figured the shoulder still was a problem. Tuberville, though, said Johnson is healthy. He just didn't play very much the other night -- presumably because coaches preferred Chris Evans and Craig Stevens. That was surprising to me. Johnson was outstanding in preseason camp. When DC Will Muschamp said Evans was going to have a place on this team long-term, he meant business. For those of you who like watching stuff beyond the SEC, you'll be happy to know that ESPN has purchased the rights to this weekend's Oregon/Arizona State game. It'll be televised on ESPN starting around 5:30 CDT. Fox Sports Net had it, but allowed ESPN (for a hefty fee) to take the game to a national market. Should be a good one. ABC (here) will have Florida State/Boston College. ESPN2 will have South Carolina/Arkansas. I'm pretty excited because I'll be able to catch some football on Saturday night. That's a rare treat made all the better with my sweet HDTV. ON A PERSONAL NOTE: Guitar Hero 3 was released Saturday night/Sunday morning at midnight. My recent purchases of Halo 3 and PGR 4 have precluded me from buying GH3, video-game moderation is imperative, so I'm looking for reviews. If you got it and played it, email me or post in the comments section. I just watched some guy knock Metallica's "One" out of the park. It got me excited. I'll say up front, though, that I cannot and will not hit this song on expert. No way. No how. Won't happen. Kids today are so good. My daughter is 5 and she hits Warrant's "Cherry Pie" on easy right now. Seriously. Five years old. If the XBox had been invented when I was a teenager, I don't think I'd have left the house. I know me. Hey everyone. Early indications from my inbox indicate Auburn fans weren't very enthused by Saturday's effort. I didn't criticize it per se. The Tigers weren't at their best by any means, but I didn't think effort was a problem. The offense is good at running and throwing short passes. Brandon Cox is not an exciting quarterback. Until Kodi Burns or someone of that ilk comes along and makes the offense more dynamic, things won't change. I don't say that to rip Cox. He's fine. It's just that quarterbacks have changed since he was recruited (seems like 1999) and he's basically a relic from the old days. If you're going to play a pocket passer now -- Colt Brennan, Matt Ryan, Andre Woodson, JaMarcus Russell, Erik Ainge, Matthew Stafford -- he must have above-average arm strength. Guys like Cox will be extinct from the SEC within five years. Rutgers deals with this issue as well. Mike Teel, the Scarlet Knights' quarterback, reminds me of Cox and Rutgers is running a two-quarterback system like Auburn. It's like when they increase the postage rate and you have to add those three-cent stamps to the stamps you bought in bulk off eBay. That continues until you run out of the old stamps. TEEL: 130-for-227, 2124 yards, 14 TD/8 TD, 6 runs for -19. Sacked 4 times. COX: 128-for-214, 1452 yards, 7 TD/7 INT, 35 runs for -37. Sacked 18 times. Thanks for reading the HOTTEST Auburn blog on the 'net. 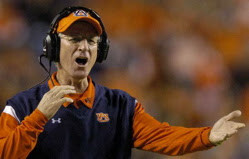 Coach Tommy Tuberville today offered some lukewarm affirmation that he plans to stay at Auburn after this season. Rumors are circulating (as expected) that Tuberville could emerge as a candidate at Texas A&M or Nebraska. Tuberville said he and agent Jimmy Sexton (or Montgomery lawyer Jere Beasley) may talk with Auburn officials during the coming weeks about a contract extension. Remember that Tuberville has no aversion to hearing his name associated with high-profile openings, so don't expect this chatter to dissipate soon. Tuberville said today that WR Robert Dunn has been cleared for a return to the field this week. The junior was suspended after a practice-field argument a few days before the LSU game. He hasn't played since. Is that a big deal? You decide.